Hach’s RTC (Real Time Control) solutions are complete off-the-shelf systems that adjust treatment processes in real time, keeping your facility compliant while reducing treatment costs. Controlling your process has never been so simple. The RTC-P System optimizes chemical phosphorus removal by adjusting chemical dosing in real time through the continuous measurement of phosphate concentration and flow, allowing you to maintain consistent effluent phosphorus values and enhance your chemical phosphorus control system for unprecedented chemical savings. The RTC-N system optimizes nitrification processes by adjusting DO concentration in real time through continuous measurement of ammonia load, allowing you to maintain consistent effluent ammonia values and enhance your DO control system for unprecedented energy savings. Designed specifically for continuously-aerated biological wastewater treatment plants, the RTC-N uses both an open and closed loop controller for optimal aeration control based on your desired effluent ammonia set-point. Hach’s RTC-N/DN system, designed specifically for oxidation ditches and sequencing batch reactors, optimizes nitrogen elimination by determining the optimal times for nitrification and denitrification based on the continuous measurement of ammonia and nitrate concentrations. Sludge thickening and dewatering processes have never run so smoothly. 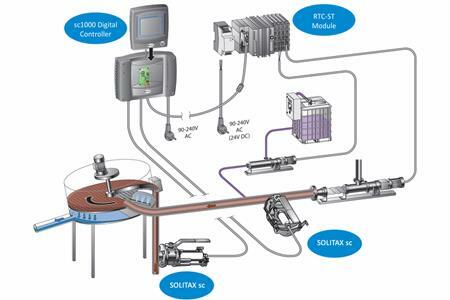 Use the RTC-ST and RTC-SD systems to control polymer dosing in real time, helping you significantly reduce your polymer dosing costs while also increasing your biogas yield and reducing maintenance and guess work running your sludge processing technologies.